The International trade deficit widened to $48.5 billion matching the Econoday consensus. Don’t give the economists too much credit because the preliminary numbers on goods gave a big tip on what was going to happen. Today’s numbers reflect goods and service. 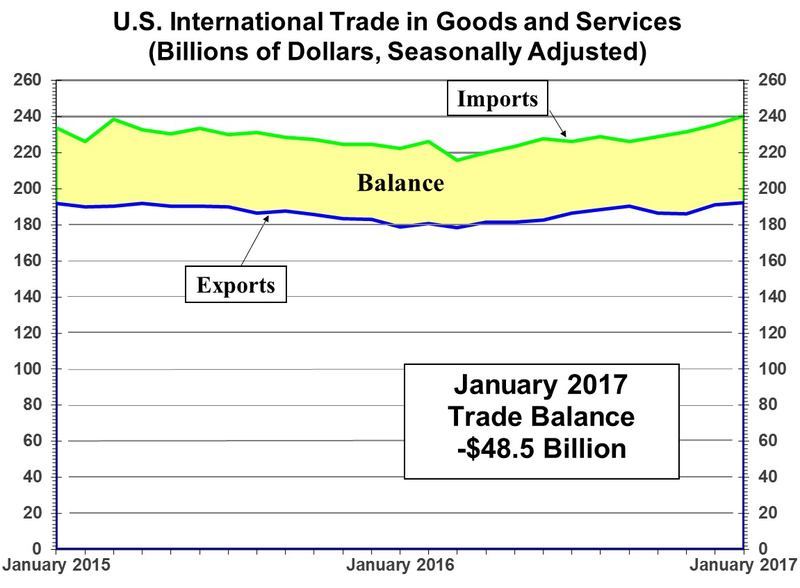 January’s trade deficit came in very deep but at least right on expectations, at $48.5 billion and reflecting a surge in foreign consumer and vehicle imports and higher prices for imported oil. January imports rose 2.3 percent from December to $197.6 billion with imports of consumer goods jumping 2.4 percent to $52.1 billion and with vehicle imports up 1.3 percent to $13.6 billion. Petroleum imports totaled $15.3 billion in the month, up 19 percent and reflecting both higher prices, at $43.94 per barrel vs December’s $41.45, and a rise in volumes, at 8.4 million barrels per day vs 7.7 million. Though dwarfed by imports, exports did rise 0.6 percent to $128.0 billion led by industrial supplies (where higher oil prices are at play) and also a 1.3 percent gain for vehicle exports to $13.6 billion as well as a $0.6 billion gain for foods. Exports of capital goods fell a sharp 1.9 percent to $43.5 billion in a decline that only partially reflected aircraft. Exports of services, usually the strength for the U.S., were unchanged in the month at $64.1 billion. Unadjusted country data show a monthly widening with China, to a monthly deficit of $31.3 billion, and a widening with Canada, at $3.6 billion. Deficits narrowed with the EU, to $11.5 billion, with Japan, to $5.5 billion, and with Mexico, to $4.0 billion. Strong demand for foreign goods and light demand for U.S. services and capital goods is not a favorable mix for GDP. This report puts first-quarter GDP on the defensive. The above charts from the Census Report on International Trade. The Trump team led by trade czar Peter Navarro is already howling. Expect more screams with the recent widening of the deficit. Atlanta Fed’s GDPNow forecast has plummeted to 1.3% following the trade deficit release. Sorry, but your link is basically the same sophomoric claptrap that conservative think tanks churn out daily to explain why it’s better for foreigners to have jobs than Americans. There’s no doubt that a small percentage of Americans make out quite nicely by trade deficits, and they are the people who fund these “think” tanks. Maybe these paid “thinkers” can explain why the rest of the world is just fine with America’s trade deficits? I guess they’re just too stupid to appreciate the advantages of mass unemployment. Cato is one of the libertarian think-tanks. They could give a $hit whether or not Americans have jobs. Seems like the offender is the US. The Fed and states keep making it more expensive to set up shop here. Even if you could be at the forefront of automation, regulations up the wazoo still means you are better off setting up your robots in another country. Correct. Automation decreases the amount of labor required to make a product, and therefore decreases the importance of the wage rate differential between a high wage rate country and a low wage rate country. All other things being equal, as the labor content of goods falls, the cost of freight would eventually become a bigger factor than the cost of labor, and manufacturing should move closer to the consumer. Unfortunately, all other things are NOT equal. Taxes, regulations, mandates, unions, etc. are also factors to be considered in deciding where to locate a factory. No worries. Trump and the Republican Congress will have this fixed in a jiffy. If trade deficits are good we should double what they are. No, triple them. I repeat myself. By having fiscal deficits the US provides and outlet for the accumulated dollars foreign counties earn. If we didn’t have a deficit those countries would have to raise their prices to stem the flow of dollars. Sure, surplus countries don’t HAVE to buy treasuries. 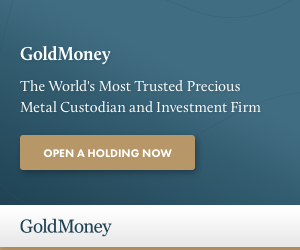 China is now a net seller of treasuries. Instead China is buying up the US with direct foreign investment. Great, a police state owns a major movie theater chain and is buying Hollywood production companies. And China is buying massive amounts of real estate. History has a way of repeating itself. Hundreds of years ago native Americans traded land in exchange for blankets and trinkets that were used up and became worthless in a few years. Today modern Americans are effectively trading land in exchange for blankets and trinkets (and laptops and cell phones) that will become worthless in a few years. If we used those imported laptops and cell phones like they were Capital Goods to Accomplish Economic Production, they would be considered a good Investment. Trading trinkets and blankets for land is comparable to trading fiat currency for foreign goods. And wait until the Chinese try to get their USA real estate through customs and back to mainland China. Maybe we should count Chinese real estate and business purchases as exports, and reduce the trade deficit that way. All the 100 dollar bills and Treasury debt held by foreigners could be counted as an export every year. Count tourists spending money in the USA as an export. The CPI and every other economic number gets adjusted and redefined. The DOW and S&P averages are always changing their components. So why not redefine the trade deficit components until the trade deficit number gets to zero. Problem solved without an unnecessary trade and currency war. What difference does it make if the Chinese own real estate in the US? It’s not like they are going to take it back to China. I remember the fervor over the Japanese back in the eighties. There is nothing to fear from foreign ownership of real estate or corporations as they can be nationalized if they need to be and in the meantime they are still subject to your laws, regulations and taxes. Off Topic, I have heard the GAAP earnings peaked about September of 2014 for the S&P 500. Is there a location we can track this metric? Might be a good discussion for the blog? subsidies for motoring, oil consumption would soon drop; half the deficit would be gone. I think the previous comments got it right. Creating more favorable USA business conditions (e.g. lower taxes, fewer employer mandates, fewer “hoops,” etc.) spurs increased domestic production. Employers have more money for production if less goes to Obamacare, taxes, etc. More domestic production naturally means more jobs and more available to export. Put more focus on Exports. If Trump’s import threats are on a country by country basis, versus across the board, and are designed to boost exports in conjunction with a better USA business environment (e.g. reduced taxes, employer mandates, regulations), it has a chance. But a mindless momentum to raise money via a tax on all imports will be Trouble, as these things tend to take on a life of their own. Economists still have a Keynesian view of the 1930s and the causes of the Great Depression, so I would not be surprised to see policies leading to a contraction in Global Trade Volume and a decline in jobs as a way to eliminate the Trade Deficit. Politics being politics, I suppose Trump has to label the Trade Deficit as Evil to get any traction and visibility for the issue. Americans want jobs but also follow their pocketbooks. I am not sure America would welcome good paying jobs if it was accompanied by a border tax or other tariff that brought down our trade deficit but made stuff more expensive. Most studies I’ve read show that most people care more about their wealth relative to their peer group than their absolute wealth. If that is the case, then I would expect people to be more comfortable having a decent paying job with higher prices than no job and lower prices. Obviously varies by circumstance.